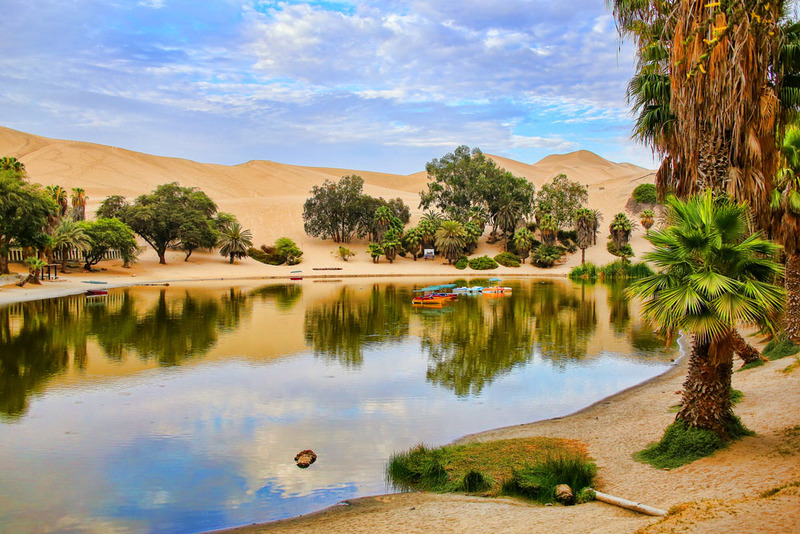 You would be remiss to visit Peru without a day trip to the lively desert oasis of Huacachina. This intriguing destination is just west of the city of Ica, and about five hours south of Lima. 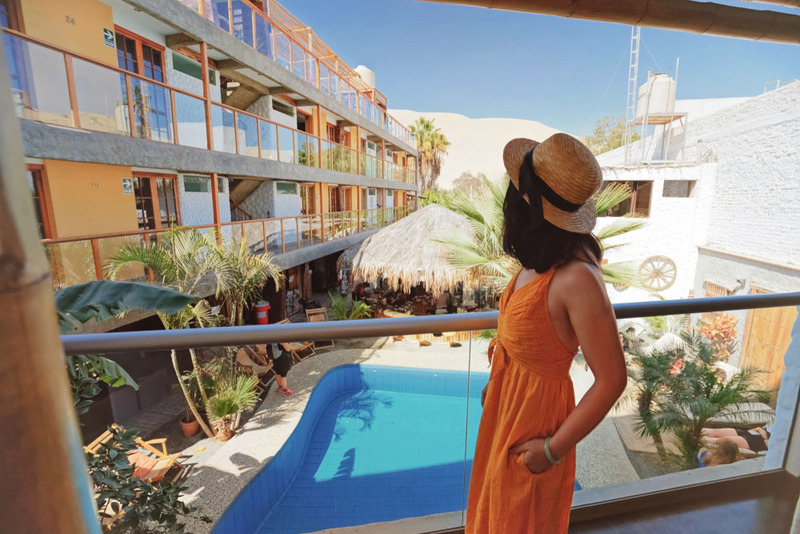 If you envision yourself sipping on a pisco sour in front of a chilled-out blue lagoon nestled in towering sand dunes, this article is written for you. 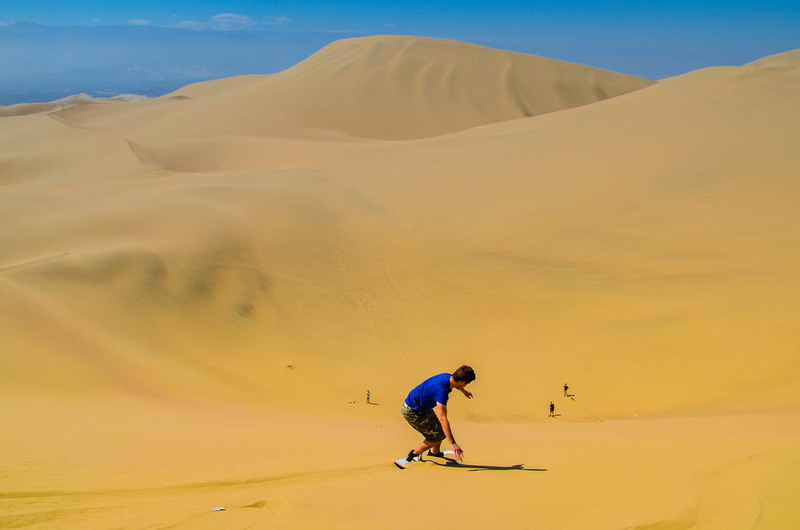 Huacachina’s lure can be attributed to a few stellar activities that you don’t want to miss. Upon arrival, Huacachina’s dunes are certain to intrigue. They present a considerable hike, but the sense of accomplishment from climbing a massive sand dune yields some major bragging rights. If scaling a towering dune isn’t your cup of tea, you can leisurely stroll around the oasis and still take in the sights. 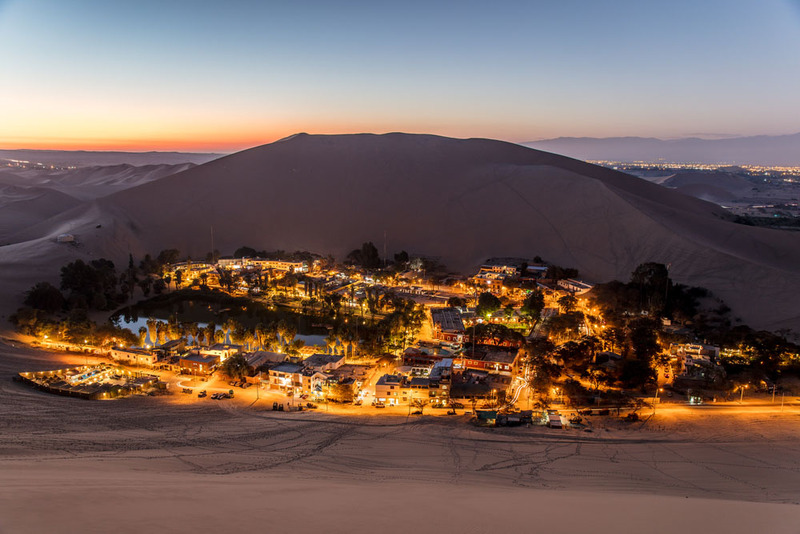 Huacachina’s whole town area can be explored in about an hour, so you just might decide to venture into the sand once you’ve walked a full loop. Dune buggy in Huacachina, Peru. Listen up, because this might be the #1 attraction in Huacachina. The dune buggy drivers have a knack for surprising riders with steep drops and harsh turns, often resulting in a group of teary-eyed laughing passengers. Some may laugh, some may cry; either way, you’ll never forget this rollercoaster of a ride. So buckle up, hold onto your belongings tightly, and trust the madness. You can easily grab a seat on a group tour upon arrival for as low as $15-20 USD. This usually includes sand boarding as well. Huacachina.com offers both individual and group pricing. If you book your whole Huacachina excursion with a tour group such as Peru Hop, this experience will be included with your bus transport. Sand boarding in Huacachina, Peru. So you think you can sand board? We’ll see about that. Most dune buggy excursions will include this activity as well. Prepare yourself for sand in new places, and endless laughs when your friends wipe out half way down the dune. If balance isn’t your forte, try bodyboarding. If you do, be sure to bring sunglasses, unless sandy eyes are your thing. Banana’s Adventure Hostel, Huacachina, Peru. Huachachina may be small, but there are plenty of places to kick back and relax. Several of the hostels double as bars and have pools- an excellent choice after a day in the desert. If you fancy a swim, you can access these hangouts by buying a snack or a drink. A little afternoon mojito never hurt anybody. Banana’s Adventure is a hostel featuring a cabana style bar, poolside of course. Wild Rover Hostel is a bar, restaurant, and hostel that is also the main pick up point for dune adventures. The pool is a laid-back hangout during the day, but the venue turns into a nightclub after hours. The Upcycled Hostel is about a ten-minute walk out of the main area, but the colorful property does not disappoint. 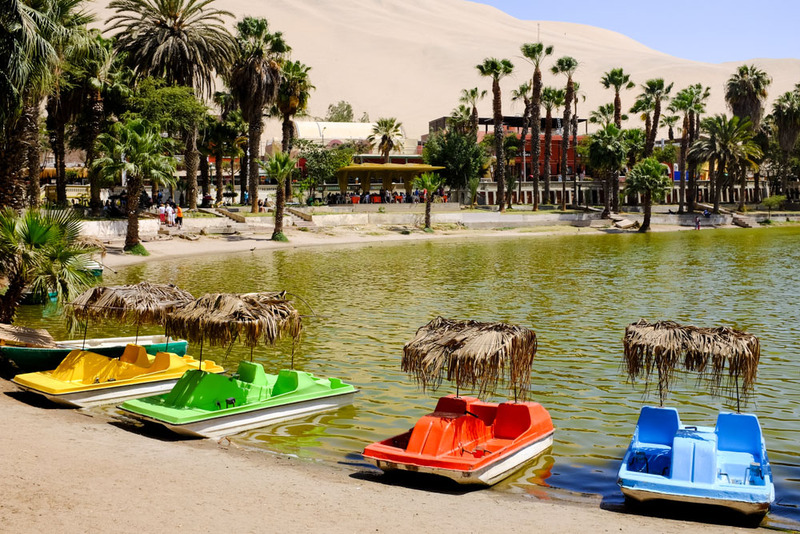 Pedal boats in the oasis, Huacachina, Peru. Have you ever cruised around a boat in a desert oasis? Yeah, I didn’t think so. Here’s your opportunity! Hire a pedal boat by the hour, and take in the sights. The water isn’t exactly swimming material, but gliding across the lagoon is a worthwhile event. The sun beats down on the lagoon during the day, making late afternoon a perfect time of day for this activity. After a full day of whipping around sand dunes, falling off of your sandboard a couple times, and enjoying a few drinks poolside, there’s only one thing left to do: watch the sunset from the top of a dune. 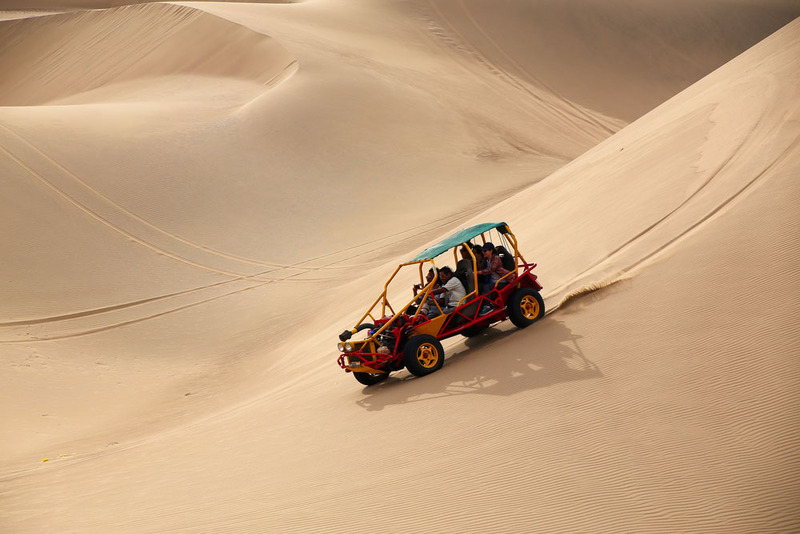 Many of the sand buggy tours will conclude around sunset, giving you the opportunity to perch yourself with a view of Huacachina and the rest of the desert. The sunset draws travelers and locals alike, uniting worlds under the shared admiration of Huacachina’s beauty.